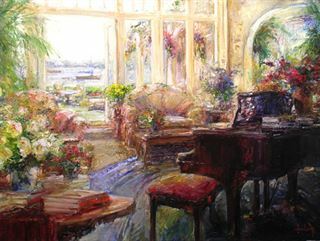 Seaside Concerto| Painters Chair Fine Art in Coeur d'Alene, Idaho features original paintings, sculpture, prints and much more. Nothing seems more peaceful to me than a calm morning, smelling crisp air off the sea. A little piano with my coffee would be a welcomed slow start to a great day ahead.